Channapatna is a city located 60 km south-west of Bangalore on Bangalore-Mysore state highway. The city is famous for its wooden toys and lacquerware. In the native language (kannada), Channapatna is also called as "goMbegaLa ooru" meaning toys town in English. These toys are manufactured in tradational or advanced small scale industries. Manufacturing and twisting of raw silk, Rice, Ragi and Coconut is a major product of Channapatna taluk. The temple of Lord Aprameya Swamy is nearby. Channapatna toys are a particular form of wooden toys (and dolls) that are manufactured in the town of Channapatna in the Bangalore Rural district, Karnataka. This traditional craft is protected as a geographical indication (GI) under the World Trade Organization, administered by the Government of Karnataka. 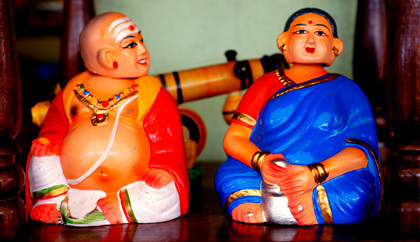 As a result of the popularity of these toys, Channapatna is known as Gombegala Ooru (toy-town) of Karnataka. Traditionally, the work involved lacquering the wood of the Wrightia tinctoria tree, colloquially called Aale mara (ivory-wood). The origin of these toys can be traced to the reign of Tipu Sultan who invited artisans from Persia to train the local artisans in the making of wooden toys. For nearly two centuries, ivory-wood was the main wood used in the making of these toys, though rosewood and sandalwood were also occasionally used. The craft has diversified over time; in addition to the traditional ivory-wood, other woods-including rubber, sycamore, cedar, pine and teak are now used as well. Manufacturing stages include procuring the wood, seasoning the wood, cutting the wood into the desired shapes, pruning and carving the toys, applying the colours and finally polishing the finished product. Vegetable dyes are used in the colouring process to ensure that the toys and dolls are safe for use by children. As of Oct 2006, more than 6,000 people in Channapatna, working in 254 home manufacturing units and 50 small factories, were engaged in the making of these toys. The Karnataka Handicrafts Development Corporation (KHDC) provides assistance with marketing efforts. With no proper backing or marketing, the Channapatna toy industry faced a financial crunch for more than a decade and was almost on the verge of dying out. However with the help of KHDC, the craft has been revived and the artisans involved are being trained on changing trends in the industry, to help them keep abreast of the current scenario. Prototypes designed by master craftsmen are introduced to the local artisans, who use them to create well-designed toys and dolls. The Government of Karnataka has also provided help by constructing a Lacquerware Craft Complex, which has a manufacturing centre with 32 turning lathe machines, at Channapatna. Financial assistance to the artisans, with help from the Dutch Government and the Karnataka Government's Vishwa scheme has also been provided. Currently there are about 6,000 artisans working in 250 home works and 50 odd small factories making these toys. They now have had the support of the Karnataka government and the KHDC now actively supports the marketing of these toys. Also the recent Geographic Indicator (GI) status to the Channapatna Toys have added further joy to the artisans. So under WTO norms these toys cannot be copied elsewhere. Distance from Channapatna, Karnataka to Ghati Subramanya is 117.9 km and travel time is around 2 h 30 min via NH275 and SH 74. Distance from Channapatna to The Forum, No. 21, Hosur Road, Koramangala, Bengaluru is 78.6 km and takes around 1 h 35 min via NH275 and NH48. Distance from Channapatna to Melukote, Karnataka is 76.6 km and travel time is around 1 h 33 min via NH275 and SH47. Distance from HN Pura Road, Channapattana to Chickmagaluru, Karnataka is 62.0 km and travelling takes around 1 h 15 min via Belur Road. Distance from Channapatna to Muthathi Anjaneya Swamy Temple is 48.3 km and travelling takes around 1 h 13 min via Channapatna-Halaguru Road.